Okay, enough procrastinating. Time to start sewing. I sewed the front 2 panels together. Easy enough. Then I had to put the zipper in. It wasn't exactly rocket science, but it took me way longer than it probably should have, partly because I may or may not have sewn over the teeth of the zipper on one side and had to rip it out and start over. I am so not sewing on the side of the panel where I can't see the zipper on the next one. I don't care what the instructions say. 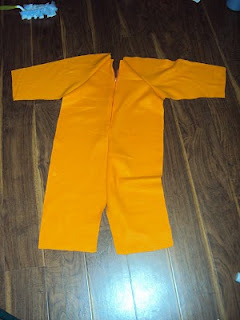 Then the two front sleeve halfs on. Except, there's something on the back that needs to be stuffed before sewing into the back. Hmm, the pattern instructions did NOT say that I need fiber fill (it's like the cottony stuff that goes in pillows). Dammit. I can't continue on this roll with out this step. I am so not in the mood to drive 30 min to the sewing store to get some. 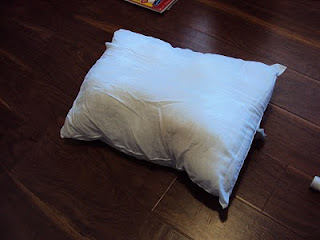 Then, my wonderful genius of a husband suggested, "Don't we have an old pillow you can use?" HELLO! Why didn't I think of that. I was only thinking on the smaller scale, toss pillows. 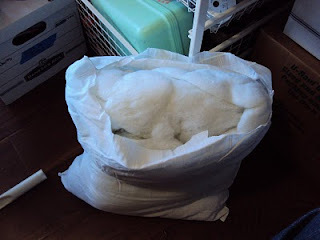 I totally forgot about the huge box of sham stuffer pillows we have in the guest room that aren't being used right now. I'm sure I will find a willing subject. Oh, Hey there big guy. How you doin? Let me have a little looksie under the hood. You weren't needin' that stuffin', were you? Didn't think so. Thanks a bunch. So I was able to get the back part stuffed and sewn in the back panels. (I'll add more pics later after the "reveal". I don't want to totally give it away!) So now I have 2 complete pieces with sleeves, front and back. Just have to sew them together.